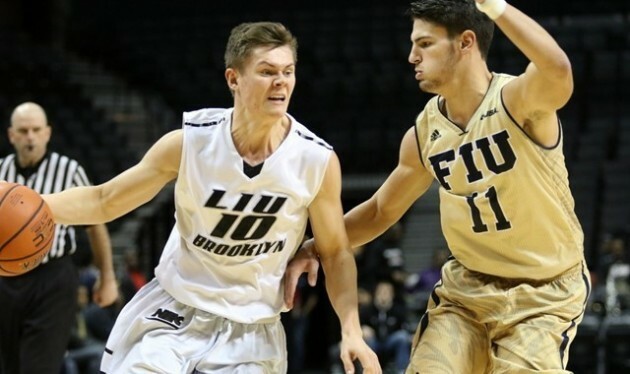 If LIU Brooklyn freshman Elvar Fridriksson had a rough go of it handling the rigors of playing basketball in America for the first time, he’s certainly getting the hang of it right before the new year. Fridriksson, the reigning Northeast Conference Rookie of the Week, drained clutch back-to-back three pointers midway through the second half to help his team reclaim the lead as the Blackbirds never looked back, defeating Florida International 69-58 on Thursday night at the Barclays Center. Fridriksson, who led all scorers with 17 points, is in the midst of playing his first season of college basketball in the United States after coming over from his native Iceland. He said it has been difficult to adjust to the fast pace and physicality of American basketball. But if those elements are still challenges, they didn’t seem to phase him on a big stage in an NBA arena on Thursday. “I wasn’t making them to begin with but in the end it fell, so I was happy with that,” Fridriksson said. The Blackbirds led by as much as 15 – at 24-9 in the first half – but they let the Panthers back into the game in the second. Florida International senior Kris Gulley knocked down a three to even the score at 32 with 18:02 left in the game. About a minute later, Gulley threw down a monster, two-handed slam off of a fast break to give the Panthers a 34-32 lead, their first of the contest. But the Blackbirds refused to give up. Fridriksson’s long-range shooting was the key to helping LIU pull out the victory. He hit his first clutch shot from behind the arc as the shot clock was expiring to put LIU up two with 10:25 remaining. On LIU’s next possession, the freshman drained another three, extending the Blackbirds’ lead to 50-45. The Panthers would get no closer than four points after that. Despite Florida International’s size advantage inside, LIU out-rebounded the Panthers on both the offensive and defensive boards, finishing with 12 offensive rebounds and 38 boards overall, compared to FIU’s nine and 29, respectively. The Blackbirds also controlled the tempo in the first half, pushing the ball well in transition and allowing FIU to get only one steal. With 5:54 left in the first half, Martin drained a three to put LIU up 27-14. Martin’s 15 points in the game included three three-pointers. Freshman Nura Zanna also scored in double digits for the Blackbirds, adding 11. “We’ve got a lot of talent on this team; anybody could step up,” said LIU freshman Martin Hermannsson, another Icelandic native. His 10 points gave the Blackbirds four double-digit scorers. Although LIU was in control for most of the first half, FIU started gaining momentum as time was winding down. With under a minute to go in the half, senior guard Marco Porcher Jimenez hit two shots from behind the arc that cut the LIU lead to five, 30-25, heading into the break. The Panthers carried that momentum into the second half and eventually took the lead. FIU scored 22 points in the paint in the final 20 minutes, but it wasn’t enough to overcome LIU and Fridriksson’s clutch shooting. LIU has now won three games in a row after starting the season with a 0-6 record. LIU will face New Hampshire for the second time this season in its next game on December 22nd. FIU, which is in the midst of an eight-game road trip, will head to Hartford to take on the Hartford University Hawks on December 21st.